Just take a look at some of the monster movers to the upside in the under-$10 complex from Wednesday, including MoSys (MOSY - Get Report) , which ripped higher by 41.8%; Violin Memory (VMEM , which jumped by 32.3%; Aegerion Pharmaceuticals (AEGR , which soared by 28.5%; and MGT Capital Investments (MGT , which spiked big by 27.6%. You don't even have to catch the entire move in lower-priced stocks such as these to make outsized returns when trading. One under-$10 basic materials player that's starting to trend within range of triggering a near-term breakout trade is Golden Minerals (AUMN - Get Report) , which engages in mining, construction and exploration of mineral properties. This stock has been in play with the bulls over the last six months, with shares exploding higher by 142.4%. If you take a glance at the chart for Golden Minerals, you'll notice that this stock has been uptrending over the last few weeks, with shares moving higher off its low of 31 cents per share to its recent high of 56 cents per share. During that uptrend, shares of Golden Minerals have been making mostly higher lows and higher highs, which is bullish technical price action. That move has now pushed this stock within range of triggering a near-term breakout trade above some key overhead resistance levels. Market players should now look for long-biased trades in shares of Golden Minerals if it manages to break out above its 50-day moving average of 55 cents per share and then above more near-term overhead resistance levels at 56 to 61 cents per share with high volume. Look for a sustained move or close above those levels with volume that registers near or above its three-month average action of 598,542 shares. If that breakout hits soon, then this stock will set up to re-test or possibly take out its next major overhead resistance levels at 75 to 87 cents, or even its 52-week high of 94 cents per share. Traders can look to buy this stock off weakness to anticipate that breakout and simply use a stop that sits right around its 20-day moving average of 41 cents per share. One can also buy shares of Golden Minerals off strength once it starts to clear those breakout levels with volume and then simply use a stop that sits a comfortable percentage from your entry point. An under-$10 technology stock that's starting to trend within range of triggering a near-term breakout trade is InvenSense (INVN , which designs, develops, manufactures, markets and sells sensor systems on a chip in the U.S., China, Taiwan, South Korea, Japan, France, Canada, Slovakia and Italy. This stock has been smacked lower by the sellers over the last six months, with shares down by 38.2%. If you take a look at the chart for InvenSense, you'll notice that this stock spiked notably higher on Wednesday right off its 20-day moving average of $6.17 a share with strong upside volume flows. Volume for that trading session registered over 1.50 million shares, which is well above its three-month average action of 1.19 million shares. That high-volume spike to the upside is now quickly pushing shares of InvenSense within range of triggering a near-term breakout trade above some key overhead resistance levels. Market players should now look for long-biased trades in InvenSense if it manages to break out above some near-term overhead resistance levels at $6.50 to $6.60 a share with high volume. 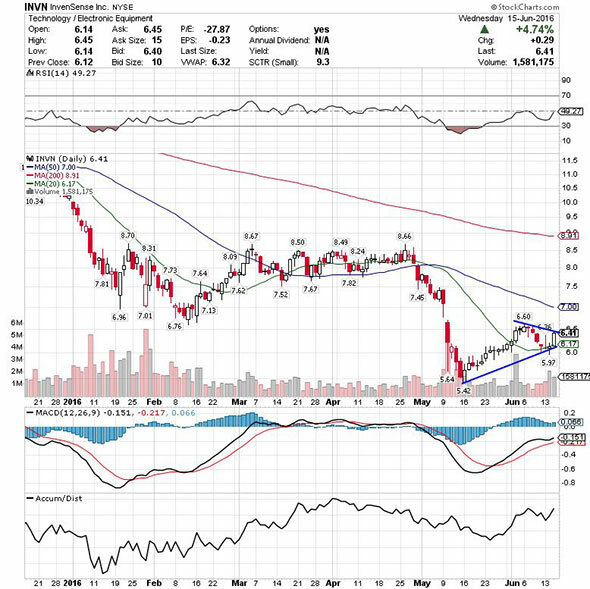 Look for a sustained move or close above those levels with volume that registers near or above its three-month average action of 1.19 million shares. If that breakout fires off soon, then this stock will set up to re-test or possibly take out its next major overhead resistance levels at its 50-day moving average of $7 to $7.50, or even $8 to $8.66 a share. Traders can look to buy this stock off weakness to anticipate that breakout and simply use a stop that sits right below some key near-term support at $5.97 a share. One can also buy shares of InvenSense off strength once it starts to clear those breakout levels with volume and then simply use a stop that sits a comfortable percentage from your entry point. One under-$10 energy player that's starting to spike within range of triggering a near-term breakout trade is W&T Offshore (WTI - Get Report) , which producers, acquires, explores for and develops oil and natural gas properties in the Gulf of Mexico. This stock has been under selling pressure over the last six months, with shares falling by 24.8%. If you take a glance at the chart for W&T Offshore, you'll notice that this stock recently formed a double bottom chart pattern, after shares found some buying interest at $1.98 to $2 a share over the last month and change. Following that potential bottom, shares of W&T Offshore have now started to spike higher back above its 20-day moving average of $2.11 a share, and it's beginning to trend within range of triggering a near-term breakout trade. Traders should now look for long-biased trades in W&T Offshore if it manages to break out above some near-term overhead resistance levels at $ $2.22 to $2.23 a share and then above $2.35 to $2.45 a share with volume that hits near or above its three-month average action of 1.69 million shares. If that breakout develops soon, then this stock will set up to re-test or possibly take out its next major overhead resistance levels at its 200-day moving average of $2.60 to $2.75, or even $3 to $3.25 a share. Traders can look to buy this stock off weakness to anticipate that breakout and simply use a stop that sits right below those recent double bottom support levels or around more near-term support levels at $1.93 to $1.91 a share. One can also buy shares of W&T Offshore off strength once it starts to move back above those breakout levels with volume and then simply use a stop that sits a comfortable percentage from your entry point. Another under-$10 stock that's starting to spike within range of triggering a big breakout trade is Neovasc (NVCN , which develops, manufactures and markets cardiovascular products worldwide. This stock has been destroyed by the sellers last six months, with shares dropping sharply by 87.6%. 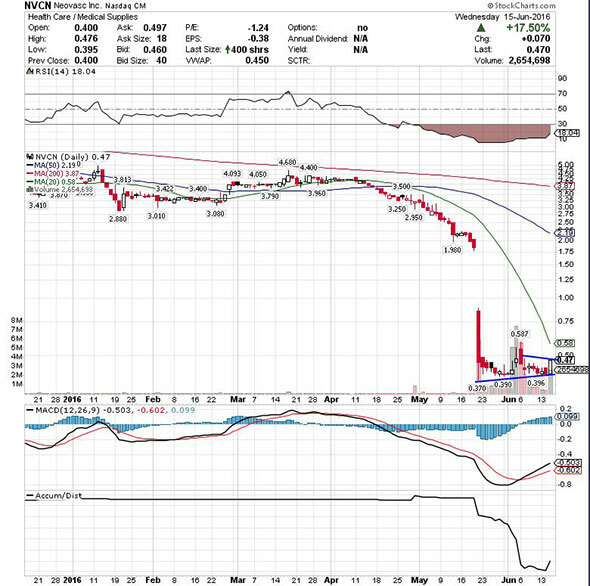 If you look at the chart for Neovasc, you'll notice that this stock recently formed a double bottom chart pattern, after shares found some buying interest at 39 to 40 cents per share. Following that potential bottom, shares of Neovasc ripped sharply higher on Wednesday off those support levels with monster upside volume flows. Volume for that trading session registered over 2.65 million shares, which is well above its three-month average action of 641,570 shares. This high-volume rip is now quickly pushing this stock within range of triggering a big breakout trade. Market players should now look for long-biased trades in Neovasc if it manages to break out above some near-term overhead resistance levels at Wednesday's intraday high of 47 cents per share to more near-term resistance around 50 cents per share with high volume. Look for a sustained move or close above those levels with volume that hits near or above its three-month average action of 641,570 shares. 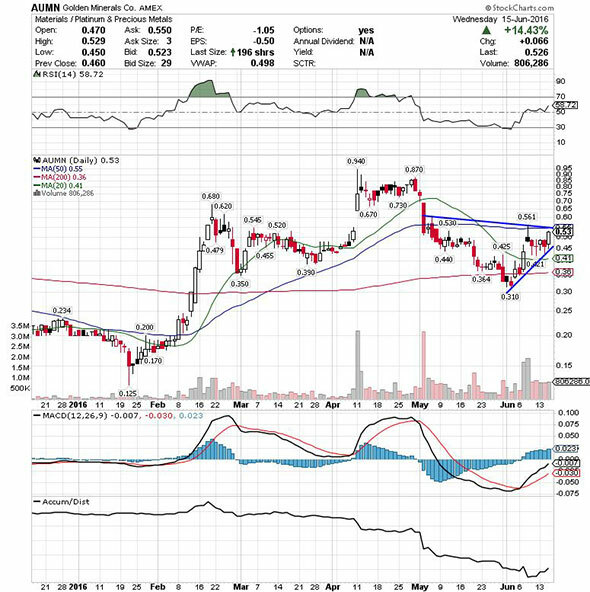 If that breakout materializes soon, then this stock will set up to re-test or possibly take out its next major overhead resistance levels at 58 to 59 cents per share. Any high-volume move above those levels will then give this stock a chance to tag its next major overhead resistance level at its gap-down-day high from May at 89 cents per share. Traders can look to buy Neovasc off weakness to anticipate that breakout and simply use a stop that sits right below those recent double bottom support levels. One can also buy this stock off strength once it starts to bust above those breakout levels with volume and then simply use a stop that sits a comfortable percentage from your entry point. 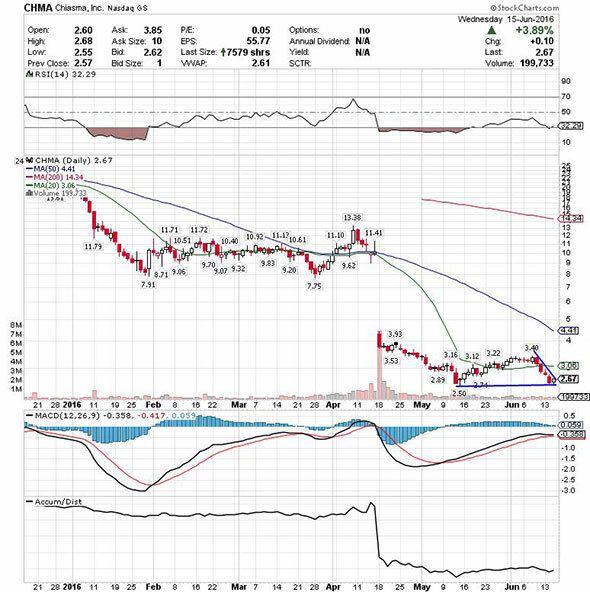 One final stock that's starting to trend within range of triggering a big breakout trade is Chiasma (CHMA , which focuses on developing and commercializing oral forms of therapies for patients suffering from orphan diseases. This stock has been destroyed by the bears over the last six months, with shares plunging lower by 88.3%. If you take a glance at the chart for Chiasma, you'll notice that this stock bounced notably higher on Wednesday right above its recent 52-week low of $2.50 a share with lighter-than-average volume. This trend to the upside is now starting to push shares of Chiasma within range of triggering a big breakout trade above some key near-term overhead resistance levels. Traders should now look for long-biased trades in Chiasma if it manages to break out above some key near-term overhead resistance levels at Wednesday's intraday high of $2.68 a share and then above more key resistance at $2.75 a share with high volume. Look for a sustained move or close above those levels with volume that registers near or above its three-month average action of 569,364 shares. 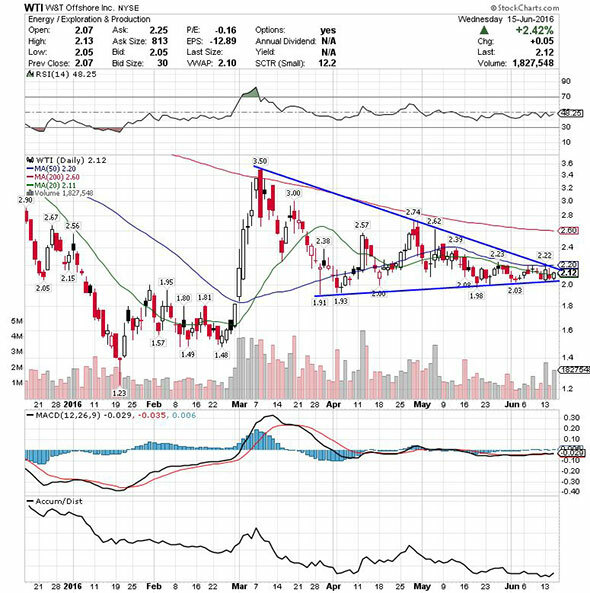 If that breakout kicks off soon, then this stock will set up to re-test or possibly take out its next major overhead resistance levels at $2.94 to its 20-day moving average of $3.06, or even $3.35 to $3.40. Any high-volume move above $3.40 will then give this stock a chance to tag its next major overhead resistance levels at $3.66 to around $4 a share. Traders can look to buy shares of Chiasma off weakness to anticipate that breakout and simply use a stop that sits right below its new 52-week low of $2.50 a share. One can also buy this stock off strength once it starts to bust above those breakout levels with volume and then simply use a stop that sits a comfortable percentage from your entry point.